From the New York Times – The Election. What struck me most about this photo was the framing. Not to often would you purposeful cut a person’s face in half at the edge of the frame (or not even show the person’s face). In retrospect to the outcome of the election you can read a lot into this photo and I think the framing makes for a more powerful image. From the New York Times – The Election. When I first saw this image, what made me stop and look at it was my photographer’s eye…”wow, what bad resolution on the photo of President Bush”. Then I noticed that it was a photo of the President on a jumbo-tron and noticed the figure at the bottom. Once I read the caption, I appreciated the impact that this photo has even more. It just goes to show that at times text adds to a photo. From the New York Times – The Election. I find this another brilliant use of framing and placing most of a key subject out of frame. To me, this image portrays a sense of power: by just raising a finger, the off frame individual (Mr. Obama) is able to garner the attention of others. From the BBC News: This image has become a favorite mostly because of the multi-faceted back story that it represents for the US Presidential Election. First, you hardly ever saw any images of Mr. Obama acting or looking anything but Presidential. I feel this played an important role in his winning of the election. Second, that of all the “Photo of the Year” sites I looked at, none of the US based ones contained any election photos of this nature. From the Sacramento Bee. The expressions and body language that was captured in this split second are priceless! From the Sacramento Bee: Timing is everything! (thought I bet that’s not the sports photo from 2008 that you expected with that comment…) This photo makes me want to find the details of the story evolving before me to find out what happened after this photo was taken. From Time: Just makes you scream internally “Look Out!”. Even better is that it appears that this photo was not directly setup, but just capturing a moment on the street. From The Wall Street Journal – The Years Best (#38): Again, an image that just stops you in your visual tracks and gives you a blink-think moment: You blink your eyes as you mind tries to comprehend what you are seeing. But again, without a caption explaining the photo, you lose a lot of value. I really wish we could see a full size version of this to try and see the expression on the faces of the villagers! I’m looking forward to seeing and taking more great photos in the year ahead. Have a wonderful and safe New Years! Note: the images above were used under the Copyright Act Fair Use clause for the purposes of criticism and comment. The images were purposefully displayed at a size that would give the viewer the general impression of the photo but require the viewing of the original (provided via multiple links) for full appreciation of the image. Thanks for posting these. I haven’t had a chance to look at all the sites yet, so it is nice to see your highlights. 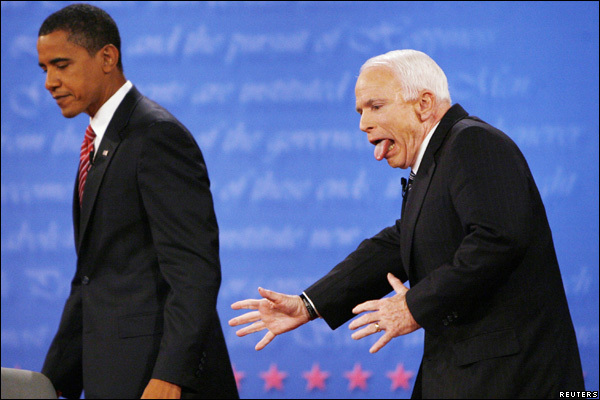 The McCain tongue shot is going to be a true classic.